A child can teach an adult three things: To be happy for no reason, To always be curious, and to fight tirelessly for something. In the scripture Jesus says something to us, that is key for us to get in the kingdom of God: you will enter the kingdom of God IF you change and become like a child! God desires for us to be like children who trust their parents. Children will even speak to strangers because they are so naive, and innocent; they do not suspect like grown ups. They get punished or corrected and a second later come back as if nothing happened, happy and lovingly back to mommy and/or daddy. God expects for us to live in this way: joyfully, excited and forgiving! I know that I have been a cynic at times, just brushing off things spoken to bring encouragement like: “God will never leave you or forsake you, he listens to your prayers!”. It’s a dangerous place to be in!!! This usually happens in people who have seen reality, and have been affected by its negativity. If a man continues to cheat, or come home late, or a friend gossips about you- you tend to refuse their apology- something like: “yea, sure, whatever or I guess.” And we can even become like this with God, it’s called all of these terms in the bible: hardening your heart, murmuring, disobedience, complaining, bitterness and rebellion. Enlightenment grows only in the soil of innocence. 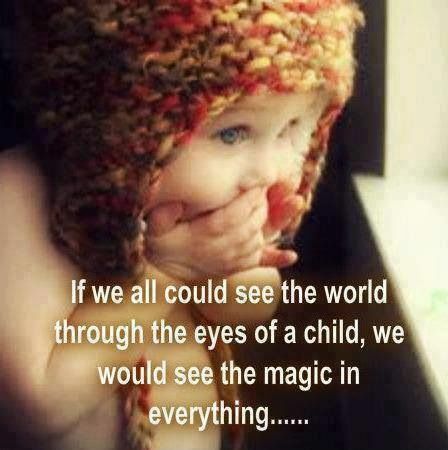 Innocence means childlike wonder, awe. Embracing childlike faith means that we must depend on God for growth, promotion, provision and every other blessing available to man. It’s different from being childish I must mention. Because being childish makes us demanding, self efficient, and independence from faith with works. To go before God as a child is to expect to be awestruck by His awesome wonder. God, give me the faith of a small child, so that I may trust you without using my own wisdom and logic! That we may simply believe you and your word without doubting. I pray you forgive for our childlike behavior, and ignorance when it comes to obedience. And may you renew our spirits to walk by faith and not by sight. In Jesus name, Amen.